I've been working on an apple dessert for a few weeks now. I tried several kinds of apple pies and apple cookies, but I was never really thrilled with the end result. During my trials (I am not giving up on those apple cookies by the way... I still haven't come up with a perfect recipe), I discovered that I really enjoyed the combination of apples and almond butter, but I couldn't find the perfect way to pair these two amazing ingredients. Well... this recipe answers it all! It basically consists of an almond shortbread cookie with a refined sugar-free salted date "caramel" and thin slices of apple. I originally wanted to add a drizzle of my vegan coconut milk caramel (from my favorite dessert that I posted a few months ago ; my vegan apple caramel "cheesecake"). Instead, I went for an inner layer of date and almond butter salted "caramel" mainly because I didn't want the bars to get too sticky or to fall apart. I also decided at the very last moment to add a crunchy almond and oat crumble on top of the apples and I'm so glad I did! The bars turned out perfect! 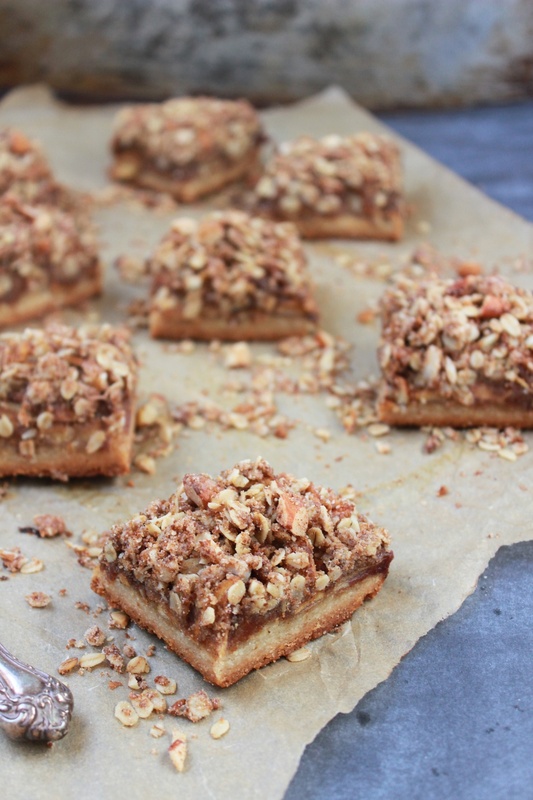 These salty and sweet bars kind of taste like a slice of apple pie (with a toasted almond shortbread crust instead of the classic buttery crust) mixed with a date square and a cinnamon apple crumble. All in one! They're pretty easy to make and only require a few steps. The first layer is a simple shortbread crust. I doubled my basic almond shortbread recipe to make it crunchier and thicker enough to support all the juicy apples and date caramel. The next layer is the salted vanilla and almond date "caramel". This caramel is made out of dates so it’s also 100% refined sugar free. I suggest you soak your dates in hot water for about 10 minutes before preparing the caramel. This way, even if you have a high quality blender (I just ordered a brand new Vitamix 750 professional blender! Woot woot! I'm in love! ), you caramel will end up smooth and creamy and your machine won't work as hard. The sauce is thick enough to support the two top layers (apple and crumble) and also thickens with cooking. I added almond butter because I think it balances the sweetness of the dates so the end result is pleasant. This date caramel is creamy, sweet and salty and is also great on top of a chia pudding or overnight oat, yogurt, crepes or pancakes, or even vanilla ice cream (wholesome banana split anyone?!). As for the apples, I added a huge layer of thinly sliced apples. You can't really see them in the pictures as they're hiding in between the date layer and the crumble, but trust me when I tell you they are the star of this dessert. You can use your favorite variety, but I suggest using two or three different kinds for a more complex flavor and texture. I personally like to use a tart Granny Smith and mix it with another apple that holds up well after cooking, like a Jonagold, Fuji, Gala, Cortland or the Pink Lady. Finally, the crumble, or streusel, adds a nice final texture and taste to the bars. The toasted almonds and oats are covered with coconut sugar, which makes it super crunchy. For the crust : Pre-heat your oven at 350F. Process all the crust ingredients in a food processor until well combine. Don't pulse too much, you don't want a smooth paste. The dough should be moist but not sticky. If you press the dough between your fingers, it should hold well together. Lay a 12" x 7" rectangle pan with parchment paper. With your hands, press the crust evenly, especially on the edges. Bake the crust for 20-25 minutes, or until slightly golden. Remove from the oven and set aside. For the date caramel : Soak your pitted dates in warm water for about 10 minutes to soften. Add pitted dates to a food processor or blender. Pulse or blend on low. Add the almond milk, almond butter, vanilla and salt and blend until smooth and creamy. For the apples : combine the thinly sliced apples (you can use a mandoline, but I prefer using a very sharp knife), flour, coconut sugar, nutmeg and cinnamon in a large bowl until all of the apples are evenly coated. Set aside. For the crumble (streusel) : Whisk the oats, coconut sugar, flour, cinnamon and chopped almond together in a medium bowl. Add the chilled coconut butter and mix with a fork (you may use two butter knives or your hands if you prefer). Set aside. Pour the date "caramel" sauce on the shortbread crust. Evenly spread with a spoon so the caramel covers all sides of the pan. Evenly layer the apples on top of the caramel. Sprinkle the apple layer with your crumble and bake for 45-60 minutes or until your apples are cooked and soft (but not mushy!) and the streusel is golden brown. NOTE : the cooking time will mainly vary depending of what type of apple you are using. I STRONGLY encourage you to check your apples after 40 minutes and after that, every 5 minutes or so, until apples are tender and cooked. Remove from the oven and allow to cool for at least 30 minutes. Lift the foil or parchment out of the pan and cut into bars (12 or 16 smaller bars). You can keep them over the counter or chill them in the refrigerator. These bars can be served warm (with a scoop of vanilla ice cream! ), at room temperature or cold.